Up until a few months ago I did not own a crock pot. Shocking I know. Sadly, we are gone for so long during the day that by the time it would be time for dinner (more than 12 hours after we leave in the morning) our food would be way over cooked. That being said, I have finally started experimenting with recipes that don't require tons of time (3-5 hours) and for longer cooking times on weekends and I am loving it. This newest recipe is via Pinterest (originally pinned from Budget Savvy Diva) and it had me at potato. I love mashed potatoes of all kinds and the idea of making them in the crock pot is genius. It frees up a burner on the stove and it basically takes all the work out of it. All you have to do is put in the ingredients, let it cook, then mash them up when its time to eat. 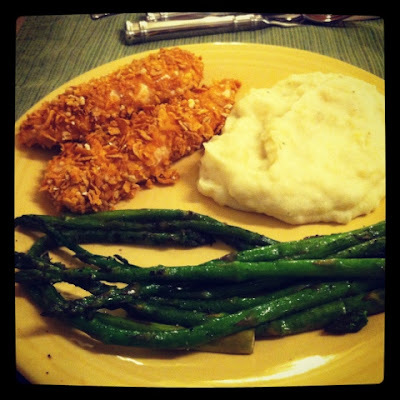 We had them with WW Honey Crunch Chicken ( made it with Fiber One this time and it was awesome) and grilled asparagus and it was the perfect meal. 1.) Peel and cube potatoes. 2.) Put potatoes, chicken broth, and butter in the crock pot and cook it for 4-5 hours on high. 3.) Roughly mash potatoes and then add the rest of the ingredients and mash again until well combined. Oh I've wanted to try mashed potatoes in the crockpot but haven't done it yet. I'm pinning this to try. Thanks so much for sharing at our Link It Up Thursday party today. This looks really good! I would never think to try potatoes in the crockpot, but I think it's definitely worth a shot now! That looks so easy and yummy!! Thanks for sharing at Thursday's Temptation. These look delicious! I have a crock pot and never really thought about making mashed potatoes in it. Thanks for sharing. Thanks for sharing at Manic Monday! They look delicious and I LOVE my crock pot recipes! Thanks so much for sharing at Mom On Timeout! Sounds yummy!! Will have to try!! But do you drain the chicken broth before mashing? Seems like it would be very runny if you didn't. Thanks! The Hubs loves mashed potatoes so I'm going to have to give these a try for him! Thanks for sharing this at Mom's Test Meal Mondays! Sounds like a nice time saver. I will try this!